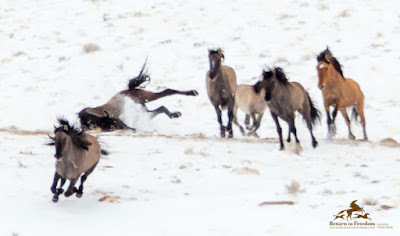 Each morning, dawn touches fewer wild horses on America's Western range lands. Roundups by the Bureau of Land Management clear the way for a tsunami of industrialization. Senate confirmation of Interior Secretary-designate, Rep. Ryan Zinke, advocates looser environmental regulations for extractive industries. He proposed legislation to open horse slaughter plants in the West. 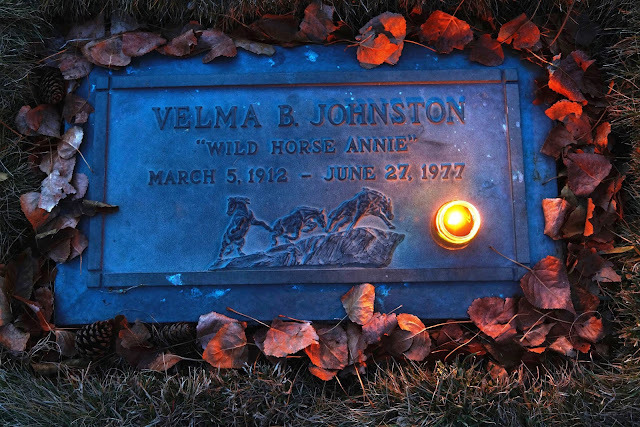 Nevadans Velma "Wild Horse Annie" Johnston and Carrol Able spend their lives fighting for America's wild horses. It seemed like a good time to give them their say, again. I sat down with Wild Horse Annie today. We had quite the conversation. I complained of how convoluted her law had become, how it was now a life sentence for the very animals it was intended to protect. She listened quietly, never uttering a word. “We really need your help.” I told her. She offered no reply. The grass surrounding us was cool damp; refreshing, the day warm and clear. I closed my eyes and imagined a band of wild horses grazing peacefully nearby. How fitting it would have been. But alas! Imaginings are nothing more than imaginings. There were no wild horses and Wild Horse Annie was not going to answer. Beside me was a small and unassuming grave marker. In that, it was much like the woman buried there. Beneath the name Velma B. Johnston, Wild Horse Annie and the dates March 5, 1912 - June 27, 1977 are three mustangs, running wild and free. As I ran my fingers across the relief and looked closer at the image, I realized there was something unexpectedly ominous portrayed there. The running mustang trio has reached the edge of a dangerous precipice with no choice left but to jump. The last of the three is rearing and looking over his shoulder as if deciding whether to fight or flee. Tears started flowing when I put the scene in the context of the battle we’re waging today. It was then that a voice came to me, a gentle but strong whisper in my ear.